Do you know that people start judging you by your appearance, even before you pronounce a single word? The way you look creates the first impression about your personality. That's why your appearance - the image people see looking at you - should express your individuality, nature and mood. Even the people who already know you should see your uniqueness and originality from your appearance. To advice you how to create an impressive look, personal styling comes to the help. This article will guide you how to become a stylist on your own without any help of a personal stylist or an image consultant. Following my fashion tips for cultivating your own personal style, you'll be able to use it for being successful in all aspects of life, whether in personal relations, career performance or in the development of self-esteem. Let's get started. First of all, what is a personal style? “Style is a direct expression of your personality or mood”(Vogue Australia). By having a personal style, you give original information to people about your character, what you like or dislike, how unique you are. 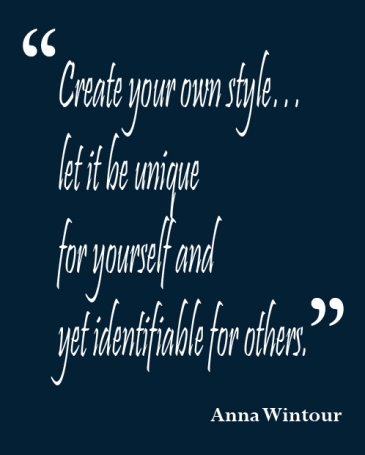 Obtaining a personal style means that you can be identified by others through it. Cultivating a personal style is an image-making – you create an image of yourself. And remember that the image should be complete from tip to toe. Style is not limited into what you wear, it includes your hairstyle & hair colour and makeup. If you see a women dressed in a beautiful red gown with lips coloured in scarlet but with a chaos on her head, it is not a full and desirable image. Before moving to the action plan, I want to draw your attention to four celebrities with distinct personal styles. 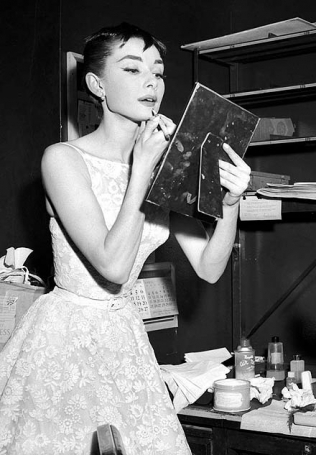 I would say that the style had played a crucial role for making these women famous and successful. - gloves as an accessory. - military-inspired shirts and coats. 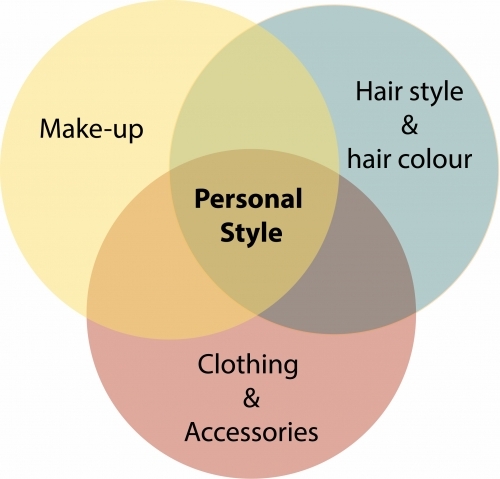 Here I will present you four easy steps leading to the development of personal style. I would suggest you to dedicate a notebook as a diary for your "style transformation period", where you will write down your thoughts and ideas on the way. 1. What lifestyle do you have? Your personal style should reflect the way you live, whether you are an active sport lover or a business lady, whether you are a night-life lover or a nature lover. Your lifestyle may be dependent on where you live - big noisy city or a quite small town; and on your age - a teenager, a student or a woman of fifty. 2. What is your body shape? One of the first things you need to understand is what kind of body you have (hourglass, athletic, pear, apple, etc.) and what works best for your body-type. 3. What are your colours? To determine your colour palette, you need to assess your hair, skin and eye colour as well as what colours you feel you look the best in (Collegefashion.net). Ask your friends about their opinion on which colour suits you best. 4. What do you find comfortable to wear? If you find the heels completely uncomfortable to wear and you struggle every time when you go to risk to step in the high pumps, it is definitely not for you. If you are stressed when wearing a short skirt or a mini-dress taking care not to show off your underwear, opt for a length you are comfortable in. So, after thinking about these questions and having the answers ready, you can create two separate pages in your notebook titled "Best to wear" and "Black-list". In the first page, list the colours that look great on you and items that you feel comfortable to wear. In the second "Black-list" name all those colours that don't fit you and wardrobe items that make you feel uncomfortable and restrain your free move - these are the items you are never going to wear. 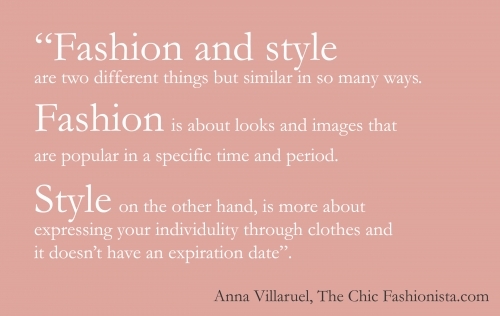 I would also suggest you to take some style quizzes that will give you a hand in identifying your personal style. 1. 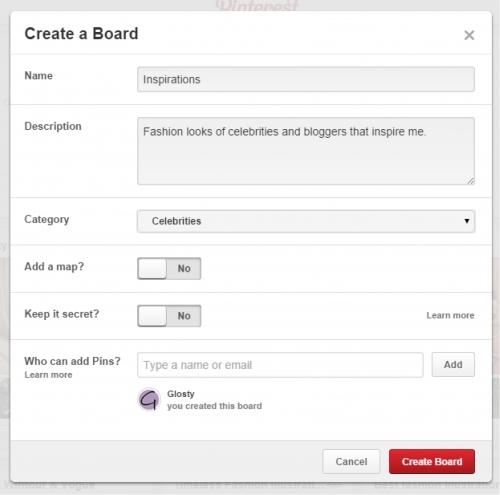 Create a Board in Pinterest and pin the looks of celebrities and bloggers that inspire you. 2. Make photos of your friends whose style you like. 3. Identify five celebrities or bloggers that could be your "style idols". Try to understand what are the distinctive features of your "style idols", the way that I did for Marilyn Monroe or Victoria Beckham. Identify what they wear more often, e.g. military coats like Victoria or Capri pants with flats like Audrey Hepburn. Look at the colour palette your "idols" use in their outfits, as well as at the separates they combine (e.g. maxi skirt with a white shirt, high-waist jeans paired with a short top). Try to describe in a few words the looks of your "style idols" and the images of your inspiration (Whowhatwear.com). Write all your finding in a new page in your notebook. If there are any kind of separates you would never wear, put them in your "Black-list". STEP 3. Combine what you like with what suits your body type. 1. Explore your current wardrobe – decide what to leave or not. Look critically at the clothing you own at the moment. Put aside the items that are pretty much worn and don't look fresh enough to wear. Note: If you have vintage style items, leave them hanging - you can create amazing looks with them. And please do not put the old stuff in a bin, instead take it to a second-hand shop. Separate the clothing that are too small or too large for you. Do not wait until you lose weight to wear them: you are going to create a new wardrobe for your current body shape. Check whether there are any items in your wardrobe that are can be in the "Black-list". If yes, take them down! 2. Build a basic wardrobe. Before creating your personalized wardrobe, be sure that you have all essentials necessary for everyday wear and special occasions, such as a pair of jeans, a white shirt, a black jacket, a small black dress etc. Make notes what essentials you need and go shopping! Before, just look through inspiration photos you collected and keep in mind the basic items your "style idols" wear. Now, when you have a basic wardrobe, you need to go further and add items that will transform the basic look into a personalized outfit. 1. Play dress-ups in front of the mirror. For example, put on a blue jeans and a white top. It is a simple look, isn't it? So, think how you can make it more interesting. There are hundreds of more ideas. Be creative while experimenting and pick up the items that suit your personal style. Do not forget to go back to your inspiration Board on Pinterest to get more ideas. Play dress-ups until you find the outfits according to your personal preferences and style. Continue working on your style, it is an evolving process. Make photos of yourself and look at them from the critical point. 2. Choose a Signature Staple. As I described above, all fashionable women own one or more signature items, like Victoria Beckham has her tip-toe boots. For your style, you can opt simply for a personalized piece of jewelry or a leopard coat (Whowhatwear.com). 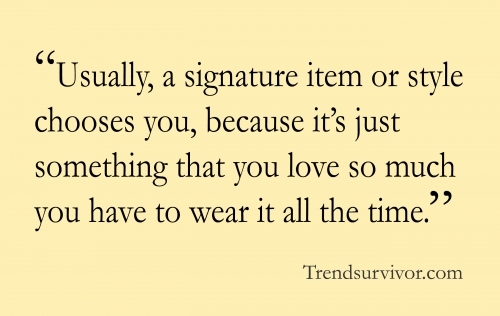 So, now you know how to develop your personal style. Always work on it, try to keep your style trendy. And remember, first impressions are half the battle. Make use of it by having a personal style. Good luck!